For other uses, see Craters of the Moon (disambiguation). Craters of the Moon National Monument and Preserve is a U.S. National Monument and national preserve in the Snake River Plain in central Idaho. It is along US 20 (concurrent with US 93 and US 26), between the small towns of Arco and Carey, at an average elevation of 5,900 feet (1,800 m) above sea level. The protected area's features are volcanic and represent one of the best-preserved flood basalt areas in the continental United States. The Monument was established on May 2, 1924. In November 2000, a presidential proclamation by President Clinton greatly expanded the Monument area. The National Park Service portions of the expanded Monument were designated as Craters of the Moon National Preserve in August 2002. It lies in parts of Blaine, Butte, Lincoln, Minidoka, and Power counties. The area is managed cooperatively by the National Park Service and the Bureau of Land Management (BLM). The Monument and Preserve encompass three major lava fields and about 400 square miles (1,000 km2) of sagebrush steppe grasslands to cover a total area of 1,117 square miles (2,893 km2). The Monument alone covers 53,571 acres (21,679 ha). 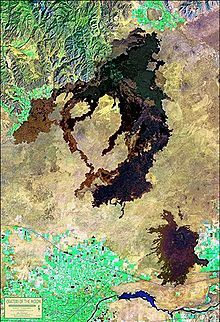 All three lava fields lie along the Great Rift of Idaho, with some of the best examples of open rift cracks in the world, including the deepest known on Earth at 800 feet (240 m). There are excellent examples of almost every variety of basaltic lava, as well as tree molds (cavities left by lava-incinerated trees), lava tubes (a type of cave), and many other volcanic features. Craters of the Moon is in south-central Idaho, midway between Boise and Yellowstone National Park. The lava field reaches southeastward from the Pioneer Mountains. Combined U.S. Highway 20–26–93 cuts through the northwestern part of the monument and provides access to it. However, the rugged landscape of the monument itself remains remote and undeveloped, with only one paved road across the northern end. The Craters of the Moon Lava Field spreads across 618 square miles (1,601 km2) and is the largest mostly Holocene-aged basaltic lava field in the contiguous United States. The Monument and Preserve contain more than 25 volcanic cones, including outstanding examples of spatter cones. The 60 distinct solidified lava flows that form the Craters of the Moon Lava Field range in age from 15,000 to just 2,000 years. The Kings Bowl and Wapi lava fields, both about 2,200 years old, are part of the National Preserve. This lava field is the largest of several large beds of lava that erupted from the 53-mile (85 km) south-east to north-west trending Great Rift volcanic zone, a line of weakness in the Earth's crust. Together with fields from other fissures they make up the Lava Beds of Idaho, which in turn are in the much larger Snake River Plain volcanic province. The Great Rift extends across almost the entire Snake River Plain. Elevation at the visitor center is 5,900 feet (1,800 m) above sea level. Total average precipitation in the Craters of the Moon area is between 15–20 inches (380–510 mm) per year. [a] Most of this is lost in cracks in the basalt, only to emerge later in springs and seeps in the walls of the Snake River Canyon. Older lava fields on the plain have been invaded by drought-resistant plants such as sagebrush, while younger fields, such as Craters of the Moon, only have a seasonal and very sparse cover of vegetation. From a distance this cover disappears almost entirely, giving an impression of utter black desolation. Repeated lava flows over the last 15,000 years have raised the land surface enough to expose it to the prevailing southwesterly winds, which help to keep the area dry. Together these conditions make life on the lava field difficult. A panoramic image of the Craters of the Moon. Paleo-Indians visited the area about 12,000 years ago but did not leave much archaeological evidence. Northern Shoshone created trails through the Craters of the Moon Lava Field during their summer migrations from the Snake River to the camas prairie, west of the lava field. Stone windbreaks at Indian Tunnel were used to protect campsites from the dry summer wind. No evidence exists for permanent habitation by any Native American group. A hunting and gathering culture, the Northern Shoshone pursued elk, bears, American bison, cougars, and bighorn sheep — all large game who no longer range the area. The most recent volcanic eruptions ended about 2,100 years ago and were likely witnessed by the Shoshone people. Shoshone legend speaks of a serpent on a mountain who, angered by lightning, coiled around and squeezed the mountain until liquid rock flowed, fire shot from cracks, and the mountain exploded. Big Southern Butte was used as a landmark by pioneers. Pioneers traveling in wagon trains on the Oregon Trail in the 1850s and 1860s followed an alternative route in the area that used old Indian trails that skirted the lava flows. This alternative route was later named Goodale's Cutoff and part of it is in the northern part of the monument. The cutoff was created to reduce the possibility of ambush by Shoshone warriors along the Snake River such as the one that occurred at Massacre Rocks, which today is memorialized in Idaho's Massacre Rocks State Park. After gold was discovered in the Salmon River area of Idaho, a group of immigrants persuaded an Illinois-born trapper and trader named Tim Goodale to lead them through the cutoff. A large wagon train left in July 1862 and met up with more wagons at Craters of the Moon Lava Field. Numbering 795 men and 300 women and children, the unusually large group was relatively unmolested during its journey and named the cutoff for their guide. Improvements to the cutoff such as adding a ferry to cross the Snake River made it into a popular alternative route of the Oregon Trail. In 1879, two Arco cattlemen named Arthur Ferris and J.W. Powell became the first known people to explore the lava fields. They were investigating its possible use for grazing and watering cattle but found the area to be unsuitable and left. U.S. Army Captain and western explorer B.L.E. Bonneville visited the lava fields and other places in the West in the 19th century and wrote about his experiences in his diaries. Washington Irving later used Bonneville's diaries to write the Adventures of Captain Bonneville, saying this unnamed lava field is a place "where nothing meets the eye but a desolate and awful waste, where no grass grows nor water runs, and where nothing is to be seen but lava." In 1901 and 1903, Israel Russell became the first geologist to study this area while surveying it for the United States Geological Survey (USGS). In 1910, Samuel Paisley continued Russell's work and later became the monument's first custodian. Others followed and in time much of the mystery surrounding this and the other Lava Beds of Idaho was lifted. The few whites who visited the area in the 19th century created local legends that it looked like the surface of the Moon. Geologist Harold T. Stearns coined the name "Craters of the Moon" in 1923 while trying to convince the National Park Service to recommend protection of the area in a national monument. Robert Limbert, a sometime taxidermist, tanner, and furrier from Boise, explored the area, which he described as "practically unknown and unexplored ..." in the 1920s after hearing stories from fur trappers about "strange things they had seen while ranging the region". The black soil on Inferno Cone exhibits the properties Limbert wrote about. I had made two trips into the northern end, covering practically the same region as that traversed by a Geological Survey party in 1901. My first was a hiking and camping trip with Ad Santel (the wrestler), Dr. Dresser, and Albert Jones; the second was with Wes Watson and Era Martin (ranchers living about four miles [6 km] from the northern edge). The peculiar features seen on those trips led me to take a third across the region in the hope that even more interesting phenomena might be encountered. Limbert set out on his third and most ambitious foray to the area in May 1920, this time with Walter Cole and an Airedale Terrier to accompany him. Starting from Minidoka, Idaho, they explored what is now the monument area from south to north passing Two Point Butte, Echo Crater, Big Craters, North Crater Flow, and out of the lava field through the Yellowstone Park and Lincoln Highway (now known as the Old Arco-Carey Road). Taking the dog along was a mistake, Limbert wrote, "for after three days' travel his feet were worn and bleeding". Management sections. Together the NPS Developed Area and NPS Wilderness Area made up the 1970 to 2000 extent of the Monument. In large part due to Limbert's work, Craters of the Moon National Monument was proclaimed on May 2, 1924 by U.S. President Calvin Coolidge to "preserve the unusual and weird volcanic formations". The Craters Inn and several cabins were built in 1927 for the convenience of visitors. The Mission 66 Program initiated construction of today's road system, visitor center, shop, campground and comfort station in 1956 and in 1959 the Craters of the Moon Natural History Association was formed to assist the monument in educational activities. The addition of an island of vegetation completely surrounded by lava known as Carey Kipuka (air photo) increased the size of the monument by 5,360 acres (22 km2) in 1962. Since then the monument has been enlarged. On October 23, 1970, Congress set aside a large part of it—43,243 acres (175 km2)—as Craters of the Moon National Wilderness, protecting that part under the National Wilderness Preservation System. 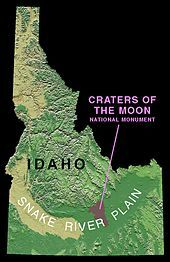 From 1969 to 1972, NASA visited the real Moon through the Apollo program and found that its surface does not closely resemble this part of Idaho. NASA astronauts discovered that real Moon craters were almost all created by meteorites while their namesakes on Earth were created by volcanic eruptions. Apollo astronauts performed part of their training at Craters of the Moon Lava Field by learning to look for and collect good rock specimens in an unfamiliar and harsh environment. For many years, geologists, biologists and environmentalists have advocated for expansion of the monument and its transformation into a national park. Part of that goal was reached in 2000 when the monument was expanded 13-fold from 53,545 acres (217 km2) to its current size to encompass the entire Great Rift zone and its three lava fields. The entire addition is called the Backcountry Area while the two older parts are called the Developed Area and Wilderness Area. Opposition by cattle interests and hunters to a simple expansion plan led to a compromise of having the addition become a national preserve in 2002 (which allows hunting, not ordinarily permitted in national parks and monuments in the U.S.). Craters of the Moon National Monument and Preserve is co-managed by the National Park Service and the Bureau of Land Management, both under the Department of the Interior. In March 2017, the Idaho Senate voted in favor of petitioning Congress to designate Craters of the Moon a national park. LANDSAT satellite photo showing the entire Great Rift volcanic zone and three distinct lava fields. The Snake River Plain is a volcanic province that was created by a series of cataclysmic caldera-forming eruptions which started about 15 million years ago. A migrating hotspot thought to now exist under Yellowstone Caldera in Yellowstone National Park has been implicated. This hot spot was under the Craters of the Moon area some 10 to 11 million years ago but 'moved' as the North American Plate migrated southwestward. [b] Pressure from the hot spot heaves the land surface up, creating fault-block mountains. After the hot spot passes the pressure is released and the land subsides. Leftover heat from this hot spot was later liberated by Basin and Range-associated rifting and created the many overlapping lava flows that make up the Lava Beds of Idaho. The largest rift zone is the Great Rift; it is from this 'Great Rift fissure system' that Craters of the Moon, Kings Bowl, and Wapi lava fields were created. The Great Rift is a National Natural Landmark. In spite of their fresh appearance, the oldest flows in the Craters of the Moon Lava Field are 15,000 years old and the youngest erupted about 2000 years ago, according to Mel Kuntz and other USGS geologists. Nevertheless, the volcanic fissures at Craters of the Moon are considered to be dormant, not extinct, and are expected to erupt in less than a thousand years. There are eight major eruptive periods recognized in the Craters of the Moon Lava Field. Each period lasted about 1000 years or less and were separated by relatively quiet periods that lasted between 500 and as long as 3000 years. Individual lava flows were up to 30 miles (50 km) long with the Blue Dragon Flow being the longest. Kings Bowl Lava Field erupted during a single fissure eruption on the southern part of the Great Rift about 2,250 years ago. This eruption probably lasted only a few hours to a few days. The field preserves explosion pits, lava lakes, squeeze-ups, basalt mounds, and an ash blanket. The Wapi Lava Field probably formed from a fissure eruption at the same time as the Kings Bowl eruption. More prolonged activity over a period of months to a few years led to the formation of low shield volcanos in the Wapi field. The Bear Trap lava tube, between the Craters of the Moon and the Wapi lava fields, is a cave system more than 15 miles (24 km) long. The lava tube is remarkable for its length and for the number of well-preserved lava cave features, such as lava stalactites and curbs, the latter marking high stands of the flowing lava frozen on the lava tube walls. The lava tubes and pit craters of the monument are known for their unusual preservation of winter ice and snow into the hot summer months, due to shielding from the sun and the insulating properties of basalt. A typical eruption along the Great Rift and similar basaltic rift systems starts with a curtain of very fluid lava shooting up to 1,000 feet (300 m) high along a segment of the rift up to 1 mile (1.6 km) long. As the eruption continues, pressure and heat decrease and the chemistry of the lava becomes slightly more silica rich. The curtain of lava responds by breaking apart into separate vents. Various types of volcanoes may form at these vents: gas-rich pulverized lava creates cinder cones (such as Inferno Cone – stop 4), and pasty lava blobs form spatter cones (such as Spatter Cones – stop 5). Later stages of an eruption push lava streams out through the side or base of cinder cones, which usually ends the life of the cinder cone (North Crater, Watchmen, and Sheep Trail Butte are notable exceptions). This will sometimes breach part of the cone and carry it away as large and craggy blocks of cinder (as seen at North Crater Flow – stop 2 – and Devils Orchard – stop 3). Solid crust forms over lava streams, and lava tubes (a type of cave) are created when lava vacates its course (examples can be seen at the Cave Area – stop 7). Landscape, Craters of the Moon National Monument and Preserve. This scoria field shows typical conditions at Craters of the Moon. All plants and animals that live in and around Craters of the Moon are under great environmental stress due to constant dry winds and heat-absorbing black lavas that tend to quickly sap water from living things. Summer soil temperatures often exceed 150 °F (66 °C) and plant cover is generally less than 5% on cinder cones and about 15% over the entire monument. Adaptation is therefore necessary for survival in this semi-arid harsh climate. Water is usually only found deep inside holes at the bottom of blow-out craters. Animals therefore get the moisture they need directly from their food. The black soil on and around cinder cones does not hold moisture for long, making it difficult for plants to establish themselves. Soil particles first develop from direct rock decomposition by lichens and typically collect in crevices in lava flows. Successively more complex plants then colonize the microhabitat created by the increasingly productive soil. The shaded north slopes of cinder cones provide more protection from direct sunlight and prevailing southwesterly winds and have a more persistent snow cover (an important water source in early spring). These parts of cinder cones are therefore colonized by plants first. Gaps between lava flows were sometimes cut off from surrounding vegetation. These literal islands of habitat are called kīpukas, a Hawaiian name used for older land surrounded by younger lava. Carey Kīpuka is one such area in the southernmost part of the monument and is used as a benchmark to measure how plant cover has changed in less pristine parts of southern Idaho. Drought tolerance by physiological adaptations such as the ability to survive extreme dehydration or the ability to extract water from very dry soil. Sagebrush and antelope bitterbrush are examples. Drought avoidance by having small, hairy, or succulent leaves to minimize moisture loss or otherwise conserve water. Hairs on scorpionweed, the succulent parts of the pricklypear cactus, and the small leaves of the wirelettuce are all local examples. Drought escape by growing in small crevices or near persistent water supplies, or by staying dormant for about 95% of the year. Mosses and ferns in the area grow near constant water sources such as natural potholes and seeps from ice caves. Scabland penstemon, fernleaf fleabane, and gland cinquefoil grow in shallow crevices. Syringa, bush rockspirea, tansybush, and even limber pine grow in large crevices. While dwarf monkeyflowers (photo) carry out their entire life cycle during the short wet part of the year and survive in seed form the rest of the time. Wildflower bloom on the Devil's Orchard trail. A plant commonly seen on the lava field is the dwarf buckwheat (Eriogonum ovalifolium var. depressum) (photo), a flowering plant 4 inches (100 mm) tall with a root system 3 feet (0.91 m) wide. The root system monopolizes soil moisture in its immediate area, resulting in individual plants that are evenly spaced. Consequently, many visitors have asked park rangers if the buckwheat were systematically planted. Wildflowers bloom from early May to late September but most are gone by late August. Moisture from snow-melt along with some rainfall in late spring kick-starts the germination of annual plants, including wildflowers. Most of these plants complete their entire life cycle in the few months each year that moisture levels are good. The onset of summer decreases the number of wildflowers and by autumn only the tiny yellow flowers of sagebrush and rabbitbrush remain. Some wildflowers that grow in the area are the arrow-leaved balsamroot, bitterroot, blazingstar, desert parsley, dwarf monkeyflower, paintbrush, scorpionweed, scabland penstemon and the wild onion. Years of cataloging by biologists and park rangers have recorded 2000 species of insects, 8 reptiles, 169 birds, 48 mammals, and even one amphibian (the western toad). Birds and some rodents are seen most frequently in the Craters of the Moon area. Brown bears once roamed this area but have long ago become locally extinct. Traditional livestock grazing continues within the grass/shrublands administered by the BLM. Most desert animals are nocturnal, or mainly active at night. Nocturnal behavior is an adaptation to both predation and hot summer daytime temperatures. Nocturnal animals at Craters of the Moon include woodrats (also called packrats), skunks, foxes, bobcats, mountain lions, bats, nighthawks, owls, and most other small desert rodents. Animals that are most active at dawn and dusk, when temperatures are cooler than mid-day, are called crepuscular. The subdued morning and evening light helps make them less visible to predators, but is bright enough to allow them to locate food. Some animals are crepuscular mainly because their prey is. Crepuscular animals in the area include mule deer, coyotes, porcupines, mountain cottontails, jackrabbits, and many songbirds. Some desert animals are diurnal, or primarily active during the day. These include ground squirrels, marmots, chipmunks, lizards, snakes, hawks, and eagles. Many animals have a specific temperature range where they are active, meaning the times they are active vary with the seasons. Snakes and lizards hibernate during the winter months, are diurnal during the late spring and early fall, and become crepuscular during the heat of summer. Many insects and some birds also alter their times of activity. Some animals, like ground squirrels and marmots, have one or more periods of estivation, a summer hibernation that allows them to avoid the hottest and driest periods. Several animals are unique to Craters of the Moon and the surrounding area. Subspecies of Great Basin pocket mouse, American pika, yellow-pine chipmunk, and yellow-bellied marmot are found nowhere else. Lava tube beetles and many other cave animals are found only in the lava tubes of eastern Idaho. In May 1980 wildlife researcher Brad Griffith of the University of Idaho started a three-year study to mark and count the mule deer in the monument. The National Park Service was concerned that the local herd might grow so large that it would damage its habitat. Griffith found that this group of mule deer has developed a drought evasion strategy unique for its species. The deer arrive in the southern part of the pre-2000 extent of the monument mid-April each year once winter snows have melted away enough to allow for foraging. Griffith found that by late summer plants in the area have already matured and dried to the point that they can no longer provide enough moisture to sustain the deer. In late July after about 12 days above 80 °F (27 °C) and warm nights above 50 °F (10 °C) the herd migrates 5 to 10 miles (8.0 to 16.1 km) north to the Pioneer Mountains to obtain water from free-flowing streams and shade themselves in aspen and Douglas-fir groves. Rain in late September prompts the herd to return to the monument to feed on bitterbrush until snow in November triggers them to migrate back to their winter range. This herd, therefore, has a dual summer range. It is also very productive with one of the highest fawn survival rates of any herd in the species. Afternoon winds usually die down in the evening, prompting behavioral modifications in the herd. The deer avoid the dry wind by being more active at night when the wind is not blowing. In 1991 there was a three-year average of 420 mule deer. A series of fissure vents, cinder cones, spatter cones, rafted blocks, and overlapping lava flows are accessible from the Loop Drive, 7 miles (11 km) long. Wildflowers, shrubs, trees, and wild animals can be seen by hiking on one of the many trails in the monument or by just pulling over into one of the turn-offs. More rugged hiking opportunities are available in the Craters of the Moon Wilderness Area and Backcountry Area, the roadless southern and major part of the monument. The Visitor Center is near the monument's only entrance. Various displays and publications along with a short film about the geology of the area help to orient visitors. Ranger-led walks are available in summer and cover topics such as wildlife, flowers, plants, or geology. Self-guiding tours and displays are available year-round and are easily accessible from the Loop Drive. A paved trail less than 1/4 mile (400 m) long at North Crater Flow (photo) crosses the North Crater Lava Flow, which formed about 2200 years ago, making it one of the youngest lava flows on the Craters of the Moon Lava Field. This lava is named for the purplish-blue tint that tiny pieces of obsidian (volcanic glass) on its surface exhibit. Good examples of pahoehoe (ropey), aa (jagged), and some block lava are readily visible along with large rafted crater wall fragments. The rafted crater wall fragments seen on the flow were once part of this cinder cone but were torn away when the volcano's lava-filled crater was breached. A 1.8-mile-long trail (2.9 km) includes the 1/2 mile (800 m) overlook trail but continues on through the crater and to the Big Craters/Spatter Cones parking lot. Devils Orchard (photo) is a group of lava-transported cinder cone fragments (also called monoliths or cinder crags) that stand in cinders. Like the blocks at stop 2 they were once part of the North Crater cinder cone but broke off during an eruption of lava. A 1/2 mile-long (800 m) paved loop trial through the formations and trees of the "orchard" is available. The interpretive displays on the trail emphasize human impacts to the area. Inferno Cone Viewpoint (photo) is on top of Inferno Cone cinder cone. A short but steep trail up the cinder cone leads to an overlook of the entire monument. From there the Spatter Cones can be seen just to the south along with a large part of the Great Rift. In the distance is the over 700-foot-tall (>200 m) Big Cinder Butte, one of the world's largest, purely basaltic, cinder cones. Further away are the Pioneer Mountains (behind the Visitor Center) and beyond the monument are the White Knob Mountains, the Lost River Range, and the Lemhi Range. Big Craters and Spatter Cones (photo) sit directly along the local part of the Great Rift fissure. Spatter cones are created by accumulations of pasty gas-poor lava as they erupt from a vent. Big Craters is a cinder cone complex less than 300 feet (91 m) up a steep foot trail. Tree Molds (photo) is an area within the Craters of the Moon Wilderness where lava flows overran part of a forest. The trees were incinerated but as some of them burned they released enough water to cool the lava to form a cast. Some of these casts survived the eruption and mark the exact location and shape of the burning trees in the lava. Both holes and horizontal molds were left, some still showing shapes indicative of bark. The actual Tree Molds area is a mile (1.6 km) from the Tree Molds parking lot and picnic area off a moderately difficult wilderness trail. The Wilderness trail also leaves from this parking lot, and extends nearly 6 miles (9.7 km) into the wilderness area before gradually disappearing near The Sentinel cinder cone. The 1.8 miles (2.9 km) Broken Top loop trail encircles the youngest cinder cone in the monument and can be done separately or as part of a longer trek on the Wilderness trail. A pull off on the spur road leading to the Tree Molds area presents the Lava Cascades, a frozen river of Blue Dragon Flow lava that temporarily pooled in the Big Sink. The caves are open to visitors but flashlights are needed except in Indian Tunnel and some form of head protection is highly recommended when exploring any of the caves. Lava tubes are created when the sides and surface of a lava flow hardens. If the fluid interior flows away a cave is left behind. Entering caves requires a free permit. Craters of the Moon Campground has 51 sites – none of which can be reserved in advance. Camping facilities are basic but do include water, restrooms, charcoal grills, and trash containers. National Park Service rangers present evening programs at the campground amphitheater in the summer. Camping enables visitors to enjoy the park during the evening and morning, when the heat, glare and wind are far less. A Lunar Ranger program enables children to earn an embroidered patch in a few hours. Backcountry hiking is available in the Craters of the Moon Wilderness and the much larger Backcountry Area beyond (added in 2000). Only two trails enter the wilderness area and even those stop after a few miles or kilometers. From there most hikers follow the Great Rift and explore its series of seldom-visited volcanic features. All overnight backcountry hikes require registration with a ranger. No drinking water is available in the backcountry and the dry climate quickly dehydrates hikers. Avoiding summer heat and winter cold are therefore recommended by rangers. Pets, camp fires, and all mechanized vehicles, including bicycles, are not allowed in the wilderness area. Skiing is allowed on the Loop Drive after it is closed to traffic in late November because of snow drifts. Typically there are 20 inches (51 cm) of snow by January and 25 in (64 cm) by February. Cross-country skiing off Loop Drive is allowed but may be dangerous owing to sharp lava and hidden holes under the snow. Blizzards and other inclement weather may occur. Hagerman Fossil Beds National Monument protects Pliocene-aged fossil sites along the Snake River. City of Rocks National Reserve contains various monoliths, spires, and domes used by the Northern Shoshone and white emigrants on the California Trail. Rock climbing is a popular activity in the reserve. Nez Perce National Historical Park has 24 archaeological sites in north-central Idaho of the Nez Perce culture. Yellowstone National Park is world-famous for its geysers, mudpots, Yellowstone Canyon, waterfalls, and wildlife such as the American Bison and reintroduced wolves. Grand Teton National Park includes the steep, glacially carved Teton Range, tectonically created Jackson Hole valley, and a string of moraine-impounded lakes. ^ Lower elevation areas near the Snake River average only 10–11 inches of precipitation annually. ^ Eruptions were dated using paleomagnetic and radiocarbon methods, which together give dates that are considered accurate to within 100 years (NPS 1991, pp. 28–29). Both tests were conducted in 1980 by using charred vegetation directly below individual flows (for the radiocarbon test), and from rock core samples (for the paleomagnetic work). ^ a b "Listing of acreage as of December 31, 2011". Land Resource Division, National Park Service. Retrieved May 13, 2012. ^ "NPS Annual Recreation Visits Report". National Park Service. Retrieved May 13, 2012. ^ a b c NPS 1991, p. 7. ^ a b Owen 2004, "Basaltic Volcanism". ^ a b Kiver & Harris 1999, p. 340. ^ a b c Kiver & Harris 1999, p. 343. ^ a b c Kiver & Harris 1999, p. 339. ^ a b c NPS 1991, p. 35. ^ a b NPS 1991, p. 13. ^ a b Kiver & Harris 1999, p. 338. ^ a b c d NPS 1991, p. 47. ^ "USGS website". vulcan.wr.usgs.gov. 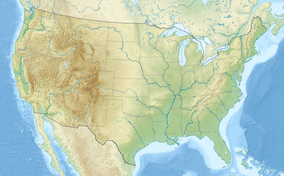 United States Geologic Survey. Archived from the original on June 21, 2012. Retrieved September 16, 2012. ^ a b NPS 1991, p. 48. ^ a b c NPS 1991, p. 49. ^ NPS 1991, p. 50. ^ Kiver & Harris 1999, p. 344. ^ a b NPS 1991, p. 8. ^ a b Limbert, Robert (1924). "Among the 'Craters of the Moon'". National Geographic Magazine: 303–328. ^ a b c NPS 1991, p. 51. ^ a b NPS website, "History & Culture"
^ NPS 1991, p. 9. ^ Phinney, William (2015). Science Training History of the Apollo Astronauts. NASA SP -2015-626. pp. 235–236. ^ a b c Clinton 2000. ^ Russell, Betsy. "Idaho Senate wants Congress to declare Craters of the Moon a national park". Spokesman.com. The Spokesman-Review. Retrieved 7 March 2017. ^ NPS 1991, p. 24. ^ Kiver & Harris 1999, p. 342. ^ NPS 1991, p. 29. ^ NPS 1991, p. 12. ^ NPS 1991, pp. 13–18. ^ a b c d e f g h NPS website, "Animals"
^ NPS 1991, p. 41. ^ NPS 1991, pp. 36–37. ^ NPS 1991, p. 38. ^ NPS 1991, p. 42. ^ a b c NPS 1991, p. 18. ^ NPS 1991, p. 45. ^ a b NPS 1991, p. 19. ^ a b c d NPS website, "Trail Descriptions"
^ NPS 1991, p. [page needed]. ^ NPS 1991, p. 64. Clinton, William Jefferson (November 9, 2000). Boundary Enlargement of the Craters of the Moon National Monument (PDF). Washington, D.C.: Office of the President of the United States. Proclamation 7373. Henderson, Paul (1986). Craters of the Moon: Around the Loop. Craters of the Moon Natural History Association. Kiver, Eugene P.; Harris, David V. (1999). Geology of U.S. Parklands (5th ed.). New York: John Wiley & Sons. ISBN 978-0-471-33218-3. Louter, David (1992). Craters of the Moon: Administrative history. Seattle, Washington: National Park Service, Pacific Northwest Region. OCLC 54665106. Retrieved August 24, 2008. NPS contributors (1991). Craters of the Moon: National Park Handbook (139). Washington D.C.: National Park Service Division of Publications. ISBN 978-0-912627-44-1. Owen, Doug (2004). "Geology of Craters of the Moon". National Park Service. Archived from the original on 21 April 2008. Retrieved September 14, 2008. USGS contributors. "America's Volcanic Past: Craters of the Moon National Monument". United States Geological Survey. Archived from the original on May 17, 2008. Retrieved August 10, 2008. WRCC contributors (2007). "Craters of the Moon NM, Idaho (102260): Period of Record Monthly Climate Summary". Western Regional Climate Center. Retrieved September 14, 2008. Wikimedia Commons has media related to Craters of the Moon National Monument. Wikivoyage has a travel guide for Craters of the Moon National Monument and Preserve.